Something a little different today, in a couple of respects. In the first instance – much as I did with critic Michael Barber and his essay on Dennis Wheatley at the start of the year – I'm turning Existential Ennui over to a guest poster, in this case Paul Simpson, a longstanding friend and colleague of mine. Paul is just coming towards the end of a five year mission as editor of Titan's Star Trek Magazine – a position I also held for a time – and has been writing professionally about genre movies, TV shows and books for close to two decades; he's currently one of the editors of Sci-Fi Bulletin. It's a great pleasure to be able to host a piece of Paul's writing. In the second instance, Paul's guest post deals with an area of publishing I've only touched on tangentially previously: audio plays and adaptations – more specifically, the Sherlock Holmes adaptations and new Holmes stories devised by British production company Big Finish. I'll leave it to Paul to elucidate further – and of course I'll be back before too long with the next instalment in my ongoing series of posts on spy fiction series – but before we sally forth, let me just note that, speaking as someone who still hasn't read any of Arthur Conan Doyle's Holmes stories (shameful, I know), the Big Finish audio plays strike me as an especially fine way to experience those tales. Oh, and there's a tenuous link here with my just-finished run of posts on spy fiction writer William Haggard, in that Conan Doyle was a contemporary of H. Rider Haggard, W. Haggard's fifth cousin. Although anyone who recognises the name above this post may associate me primarily with sci-fi (and particularly Doctor Who and Star Trek), I've had an abiding interest in crime and spy fiction ever since childhood. My mother was brought up reading these sorts of books, so there were plenty of 1930s and '40s editions of Leslie Charteris's Saint stories, G. K. Chesterton's Father Brown books, and of course, Sherlock Holmes on the bookshelves. And of course there have been new stories in other media. One of my favourite Holmes films, after the Rathbone and the Cushing Baskervilles adaptations, is Murder by Decree – not for its off-the-wall theories about the Ripper, necessarily, but for its expansion of Holmes into "real" life. The BBC have produced The Further Adventures of Sherlock Holmes, which have been of variable quality in terms of story, but never less than entertaining. Now independent production company Big Finish have got in on the act. Big Finish has been around for some time, producing audio plays connected to various TV series – Doctor Who primarily, but also Sapphire and Steel, The Tomorrow People, Stargate and Robin Hood among many others – and have gained a deserved reputation for their output. The current executive producer is Nicholas Briggs (yes, the guy who does the Dalek voices on telly), who also continues a career as a stage actor. One of the roles he's played is Holmes – and it's hardly surprising, therefore, that he has overseen a range of audio plays featuring the character. The first set of three were released last year, adapting three of the Holmes stage plays. 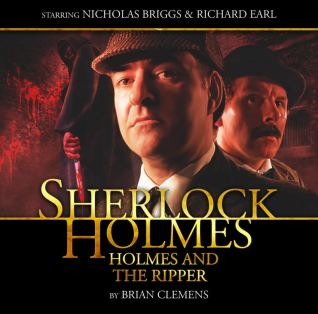 Two starred Roger Llewellyn: David Stuart Davies's one-man plays The Last Act and The Death and Life; the other, Brian Clemens's Holmes and the Ripper, starred Briggs himself with Richard Earl as Watson. Although Clemens's play doesn't particularly work for me, the combination of Briggs and Earl is a winning one, and that has been retained for the new season, currently being released. The second season is different in format, with one canonical release followed by a new story, or adaptation of a new tale. 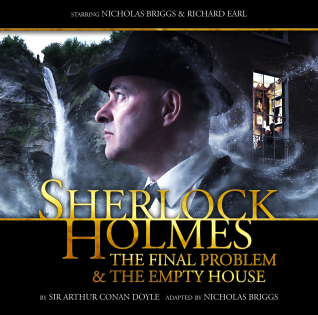 It kicks off with a 2-CD version of The Final Problem and The Empty House – otherwise known as the "Death and Resurrection of Sherlock Holmes". 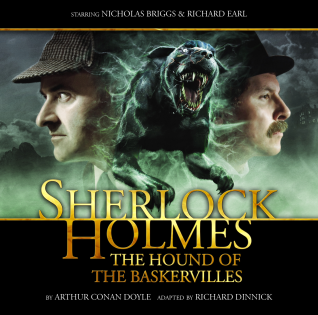 Hopefully there's no need to rehearse Conan Doyle's reasons for writing these stories, but particularly given that Briggs's adaptation is incredibly faithful to the source material, it's interesting to note the slight differences in style (and Doyle's ignoring of some of the events he chronicles in The Final Problem when writing The Empty House some years later – who cleared up Baker Street?). Both Briggs and Earl excel in this release. 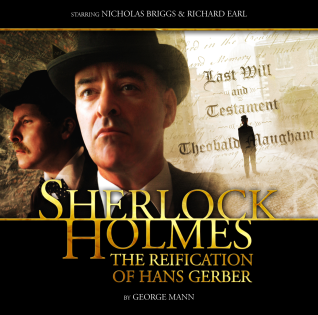 The pent up emotions that Watson experiences in the tales is brought to the fore by Earl's performance, his voice threatening to break on more than one occasion as he recounts the dreadful events leading to Holmes's death, while Briggs delivers the long monologues as he describes his adventures in a way that grips the listener. This is a Holmes under more acute pressure than any he's experienced before, and you can hear that in Briggs's delivery. The second story, The Reification of Hans Gerber, is a totally new tale by George Mann, and plays with a lot of the tropes of Victorian novels. There's a distressing death of a beloved relative, greedy grasping potential beneficiaries, lawyers who may or may not have hidden agendas, and among all this, the arrival of a mysterious figure from the continent – the eponymous Hans Gerber. To say more about the plot would spoil some of the surprises (although Mann plays fair, and everything that happens can be deduced from the evidence presented to the listener – from every source, it's fair to hint), and unlike many Holmes tales, this takes into account Watson's professional background. There's even a new foil for the great detective (nicely played by versatile voice actor Terry "Davros" Molloy). Both of these are highly recommended.